Kanye West massively increased the value of some road-side lemonade stands by selling unreleased Yeezys in small towns across the US. Whether on television or in real life, most of us have seen how a lemonade stand works. The table is usually located in a front garden or on a sidewalk, and manned by a hopeful young child trying to earn a bit of extra cash. Most of the time, the seller just offers homemade lemonade and Kanye is nowhere to be seen. However, the rapper has changed the game once again, after recently opening up stores in Indiana, Minnesota, Texas, Iowa, Ohio, South Dakota, and Los Angeles suburb Hidden Hills. 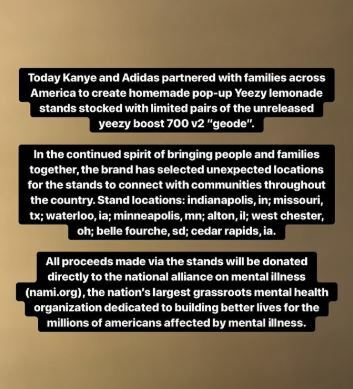 Kanye and Adidas partnered with families across the country yesterday (March 22), to create the homemade lemonade stands, selling previously unreleased pairs of Yeezys. Unfortunately the Yeezy Boost 700 V2 ‘Geode’ cost slightly more than your average cup of lemonade, at $300, but it was all for a good cause as the proceeds are being donated to the National Alliance on Mental Illness. Kim Kardashian-West shared a series of posts to her Instagram story, documenting the construction of her own family’s stand in Hidden Hills, while explaining what the stunt was all about. In the continued spirit of bringing people and families together, the brand has selected unexpected locations for the stands to connect with communities throughout the country. 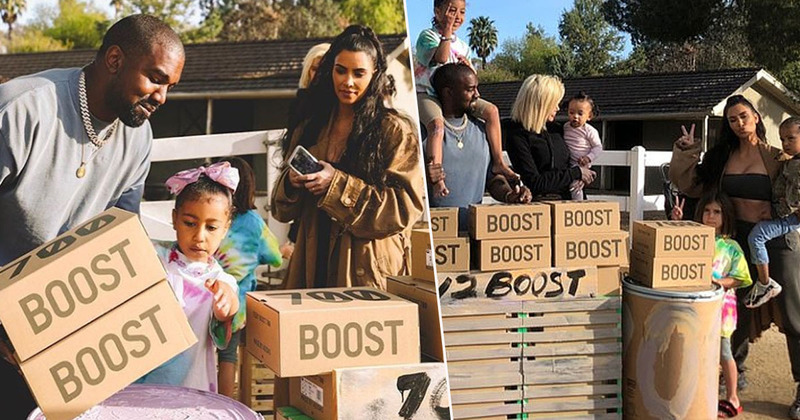 The reality star’s videos showed her children helping to paint and set up their stand, before stocking it full of Yeezys and opening for business. Thanks to the friends that stopped by to get their pair of Yeezy Boost 700 v2 before the rest of the world. Love the extra support for mental illness. We’re here for a few more minutes. Come see us at the park. If you missed your chance to stop by one of the stands, you can still donate to the National Alliance on Mental Illness here. It’s great to see the money go to a good cause!